The University of Dallas is a co-educational, Catholic university that was founded in 1956. The Braniff Graduate School was established in 1966, when the school began to offer graduate business management programs. The Graduate School of Management was founded in 1969, due to the rapid growth of the Master of Business Administration. The university established the College of Business in 2002. It was renamed the Satish & Yasmin Gupta College of Business in the fall of 2013, honoring two alumni for a generous gift. The main campus of The University of Dallas is located in Irving, Texas, about 20 minutes from Dallas and about 10 miles from the Dallas-Fort Worth International Airport. 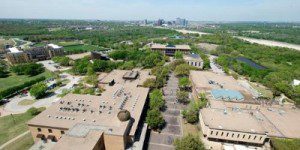 The campus sits on 225 acres that overlook both the Las Colinas Urban Center and the center of the Dallas-Ft. Worth Metroplex. The University also has an international campus near Rome, Italy. A new 45,000-square-foot academic building for the Satish and Yasmin Gupta College of Business was completed in 2016. The building, known as SB hall, holds faculty offices, classrooms, and group study spaces. It also has LEED certification. Students at the College of Business have access to the Satish & Yasmin Gupta College of Business Learning Center. The COB Learning Center can be found on the bottom floor of Blakley Library. There is also a Virtual Learning Center available to students online. Coaching is available for students that are in need of help with writing, finance or accounting and statistics. Students can also get career help and guidance from the Office of Personal Career Development and the Center for Professional Development. The Office of Personal Career Development provides alumni and current students with career counseling and career development services and resources. The Center for Professional Development provides training and continuous learning for working professionals that are enrolled in the MBA program. There are 29 faculty members at the College of Business. The student-faculty ratio is 10:1. The average class size is 16. There are a total of 524 graduate students at the business college. Nineteen percent of the students are international students, representing 36 countries. The average graduate students age is 33 years. The Satish and Yasmin Gupta College of Business offers a flexible MBA and a flexible MBA with a concentration.